Node matrices provide a way to see coding intersections between two lists of items in your project. For example, a node matrix can be used to compare what small businesses and large businesses say about different forms of renewable energy. Each cell in the matrix represents a node containing the content coded at the intersection of the row and column. 1 Columns—contains the items you select to display in columns—for example, small businesses and large businesses. 2 Rows—contains the items you select to display in rows—for example, wind power, solar power, hydro power, biofuel, and geothermal. 3 Cells—this can include the number of coding references at the intersection of a row and column—for example, How many comments do large businesses have about solar power? You can change the cell content—for example, to display number of files or words coded. The status bar indicates the type of cell content currently displayed. 4 Click the Chart tab to see a visual representation of the matrix. How are node matrices created? Run a Matrix Coding query. With matrix coding queries, you can ask a wide range of questions about patterns in the data and gain access to the content that shows those patterns. For example, you could create a Matrix Coding query to compare what small businesses and large businesses say about different forms of renewable energy. The results are displayed in a node matrix. Each cell in the matrix represents a node containing the content coded at the intersection of the row and column. When you run a Matrix Coding query, you can choose to store the results in either the Node Matrices folder (as a node matrix) or the Query Results folder (as a results node matrix). Both of these folders are located in the Search folder in Navigation View. You can double-click a node matrix in List View to open it in Detail View. If you want to see the matrix results as a chart, click the Chart tab on the right. You can expand the column widths or use the scroll bars. You can double-click on a cell in the matrix to open the node containing the content coded at the intersection of the row and column nodes. What can I do in a node matrix? You can open a node from a matrix cell to see all the content coded at the cell (at both the row and column nodes)—double click on the cell to open the node. Although the cells represent nodes that you can open and explore, you cannot code at nodes in the matrix. Copy or move the matrix into the Nodes folder—this creates a hierarchical node structure based on the cells within the matrix. 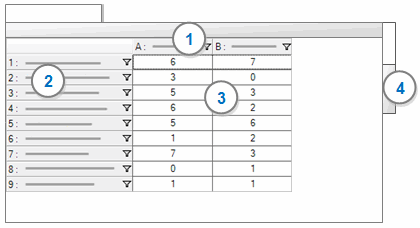 You can export a node matrix to a text or spreadsheet file or as an SPSS sav file. This can be useful if you want to share the matrix with someone who does not have NVivo or want to include the matrix in a report. In List View, select the node matrix you want to export. (Optional) Choose a different location to save the file to. (Optional) Change the file name. In the Save as type box, choose the file format for the exported file.